No matter how hard we work to keep a clean house, there are going to be times when things get out of order. Whenever you need to restore order quickly, try this emergency cleaning plan. We’ve all been there. 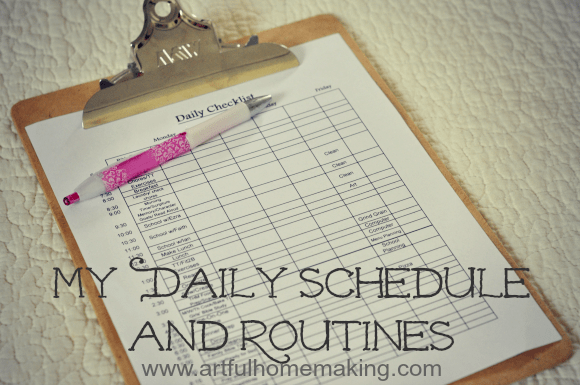 We make schedules, use a planner, and do our best to keep up with the laundry and cleaning. But somehow the house looks like a tornado hit. Piles of dirty laundry, socks all over the living room floor, and dirty dishes filling the sink. 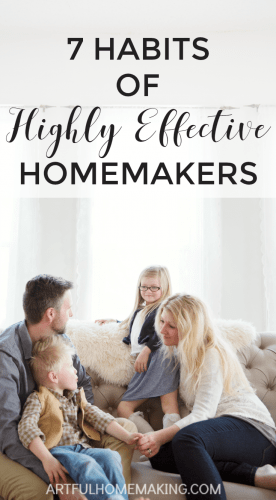 It’s enough to make any homemaker feel discouraged! This often happens when we get overly busy or we’re dealing with illness in the home (particularly if Mom is sick!). Whatever the reason, sometimes it just happens. And rather than panic or avoid the mess, you need a plan. That’s where an emergency cleaning plan comes in. I’ve found that whenever I have a plan, somehow things don’t seem quite as discouraging. I have a place to start. And getting started is often the hardest part of the battle. Whenever I’m faced with a huge mess (such as what often happens when I’m emerging from months of morning sickness or returning from a long trip), I almost always start with laundry. Just getting a load started makes me feel better. While I’m working on other areas of the house, I feel happy knowing my washing machine and dryer are working away for me in the basement! As soon as one load is done, I start another. Next, it’s time to wipe down all the surfaces in the kitchen. This is just a quick clean, so work quickly, wiping out the sink (baking soda works well for this), counters, table, and fronts of appliances. I love using Mrs. Meyer’s Multi-Surface Spray for wiping things down (or, you can just use some vinegar and water mixed together in a spray bottle). After wiping everything down, quickly sweep the floor. Light a candle or turn on your essential oil diffuser to give the room a nice scent! Squirt some cleaner into the toilet and let it soak for a few minutes while you work on the rest of the bathroom. Pick up dirty clothes and put them in the hamper, clear off the counter top, and put everything in order. Wipe out the sink, wipe down the counter top, and clean the mirror. Swish and flush the toilet, and clean the exterior of the toilet from top to bottom. 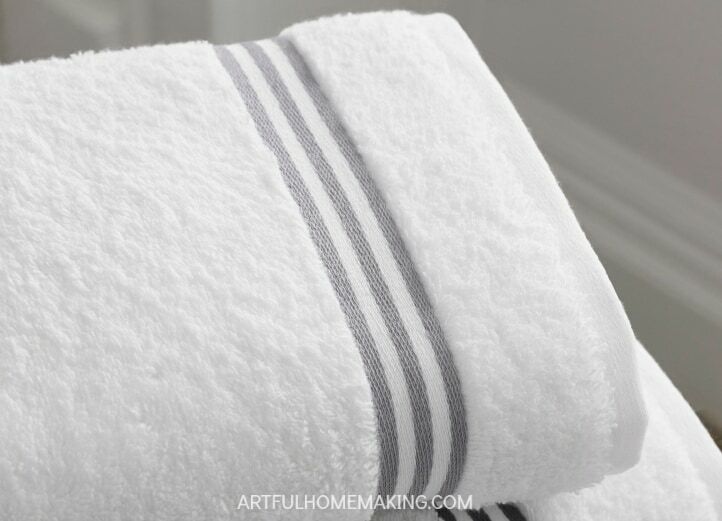 Sweep the floor and hang a fresh hand towel. Then light a candle to make the room look cozy and welcoming. Do a quick pickup of the living room, putting away everything that doesn’t belong in there. It really helps to set a timer for 15 minutes while you’re working in this room. Put everything back in its place and straighten pillows, throw blankets, etc. After the room is picked up, do a quick dust/wipe down of the room. Then it’s time to vacuum. Quickly vacuum the living room and entry way. If you have time, quickly go through the bedrooms, straightening and cleaning. If you don’t have time, skip those for now, and plan to work on them later. If your children are old enough, be sure to have them help you with this emergency cleaning session! 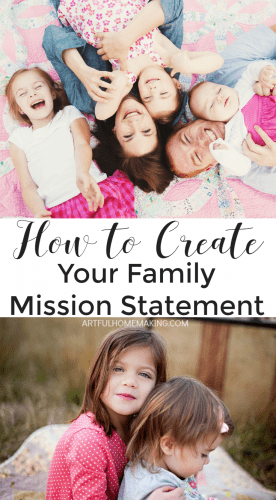 Even though we have a chore system in place that works pretty well most of the time, sometimes we still need to follow this plan to get things back in order. When we’re doing an emergency clean, it helps to assign certain children to a specific task. Rather than just saying, “go clean your room,” I’ll usually make a list of each chore broken down into smaller, more manageable chunks. Now that your space is manageable again, make yourself a daily cleaning schedule (if you don’t already have one), and make sure you’re keeping up with regular cleaning tasks. 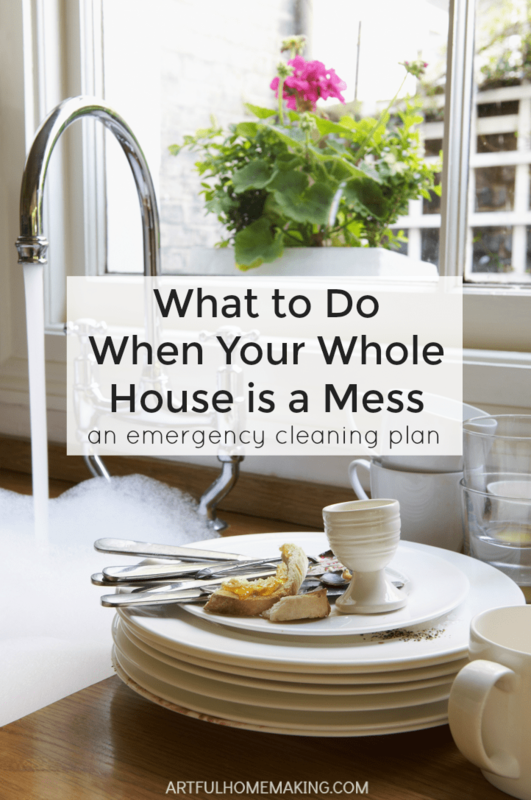 But when life happens (as it always does), use this emergency cleaning plan to get back on track! In reading this, I saw something that I do differently. Do you know that if you dust BEFORE you vacuum, all the particles that spread into the air while vacuuming, (AKA dust)will be back on your furniture. I have learned this the hard way and always dust AFTER I vacuum. Very helpful point! Thanks for sharing, Cate! I feel like I need to do this most days! I honestly don’t have enough hours in the day for cleaning, but I find that if I do a little bit each day I usually manage to keep on top of things. Great ideas for turning a mess into a castle. I always get the laundry going first; it definitely feels like a win when all the appliances are working, too. This is very true. When I start doing just one thing it’s enough motivation to get started in the rest of the house. I love how it works that way! 🙂 Thanks for stopping by, Tiffany! I always get so overwhelmed when my whole house is messy, and then rather embarrassed when I finally get the “strength” to clean it up and it only takes a couple of hours to have in back in presentable condition. LOL – when my whole house is a mess, nothing is “quick” Before we can wipe down the kitchen counter we have to find it. Haha! 🙂 Yes, you have a point there, Heather. That’s why we usually get the dishes going before we wipe down kitchen counters. Once that’s done there shouldn’t be any dishes around, but there might be other things that need to be put away first! I’m constantly in this stage of emergency clean up. Dealing with lots of morning sickness and 4 little ones it can become messy so quickly. This is basically how I’ll tackle the house. 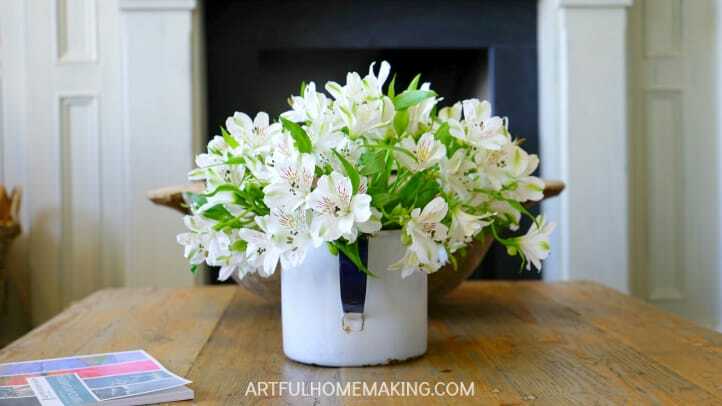 I also try to start on one corner of the house and move through it all as it can be hard to know where to start. Sometimes making yourself a cup of hot tea in the winter or something iced in the summer helps get me moving if I’m hot or cold. That’s a great idea to start in one corner of the house, and I agree about getting yourself something to drink! Hope you’re feeling better soon!